For tax purposes, time is divided into a series of blocks known as ‘chargeable periods’. According to the definitions in the Income Tax Act, this term covers two types of period; the first of these is known as a period of account, while the second (confusingly) is known as an accounting period. These apply to calculations regarding income tax and corporation tax respectively. In most cases, a period of account coincides with the tax year; for example, a self-assessment taxpayer’s annual period of account would run from 6th April to the following 5th April. The Income Tax Act states, however, that ‘trading, professional or vocational’ accounts need not have periods of accounts that run concurrent with the standard tax year. In most of these cases they will instead have an accounting period, the start and end of which will be determined by a number of separate factors. Essentially, an accounting period determines the time at which Corporation Tax must be paid. The period cannot legally be any longer than 12 months but, as mentioned above, there are a number of other factors that decide its length. In the first instance, an accounting period begins when a company comes within the corporation tax charge, either when it begins to trade if it is not already within the charge or when it takes on its first income source. The time at which the accounting period ends, however, is determined by an even larger set of factors. Some organisations may have considerably shorter accounting periods than 12 months. All publicly owned companies, for example, must present quarterly statements (known as interim financial statements), meaning that they have four accounting dates every year. In some circumstances, however, most notably in the cases of co-operative organisations, HM Revenue and Customs may give these organisations special dispensation to effectively roll each of these accounting periods into one. From an individual’s point of view, a period of accounts relates to the 12-month period at the end of which it will be decided how much Income Tax must be paid. If you are a Self-Assessment Taxpayer, this will be of considerable importance to you, as it will determine your total tax bill at the end of the year. 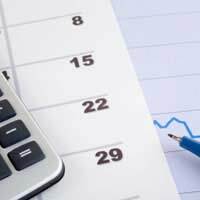 In these instances, your period of account will almost certainly correspond with the fiscal year. This is as a result of the uniform time at which every self-assessment taxpayer must send back their tax returns to the Inland Revenue in order to ensure that everyone pays at the same time.